While the Real Estate Market in Bozeman is generally the focus of this article, Belgrade, our neighbor to the west, is important to watch as well. Belgrade is a vital part of the Gallatin Valley. From the first of the year through August 1st, 194 single-family homes have sold in Belgrade at a median sold price of $316,950. This is compared to 206 single-family homes sold during the same time last year at a median sold price of $280,750. This equates to a nearly 13% increase in median sold price. Looking at condo & townhouse sales, the data is interesting. Fifty-one units sold during the first 7 months last year while 55 units sold this year. Median sold pricing increased over 15% from $182,000 to $210,000. The month’s supply of homes has stayed steady from this time last year to present, hovering around 1.9 months. This is the number of months it would take to sell the current homes on the market at the current pace. A lower number generally constitutes a seller’s market, while a higher number indicates a buyer’s market. The strong demand in Belgrade has kept builders busy as new construction homes continue to go up. Sixty-six new construction homes have sold thus far this year through our local MLS. This is compared to 55 new construction homes sold during the first 7 months last year, 41 the year before, and 36 during the same time period of 2015. Days on market has remained steady from last year to this, albeit very low. The median days on market for the entire Belgrade residential market was 15 days for the first 7 months of both last year and 2018. 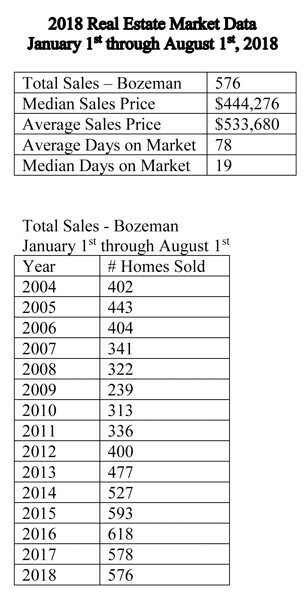 As usual, I have included data for the number of single family homes sold in Bozeman during the first seven months of 2018. In addition to the 576 homes sold during this time period, another 171 homes are currently pending, or under contract, as of the date of writing this article. This time last year, the number was very similar with 174 homes pending. The included data reflects sales of homes in the greater Bozeman area, including Four Corners, Gallatin Gateway, Bridger Canyon, and Bozeman city limits. The data includes home sales reported through the local Big Sky Country MLS and does not include private-party sales, condominiums, or townhouses.